Ohio State Highway Patrol Trooper Scott Davis and SAFE Delaware Coalition Coordinator Jackie Bain speak to drivers and answer their questions Thursday during the Mature Driver Workshop at SourcePoint. Mary Lou Gallimore, a traffic safety programmer with AAA, answers questions about safe driving and resources Thursday during the event at SourcePoint. Attendees at Gallimore’s station also had the opportunity to spin a wheel and win driving-related prizes from AAA. AAA, SAFE Delaware, Delaware Area Transit Agency (DATA), law enforcement and SourcePoint all teamed up Thursday afternoon to host a Mature Driver Workshop which featured discussions, seminars, and hands on activities about driving as an older adult. Schwind said the safety of senior drivers remains a major concern on area roads as the number of Delaware County crashes involving drivers age 65 and older has risen each of the past five years, according to Ohio Department of Public Safety crash statistics. Schwind said the workshop focused on resources and information to help mature drivers make good decisions about driving and their safety. 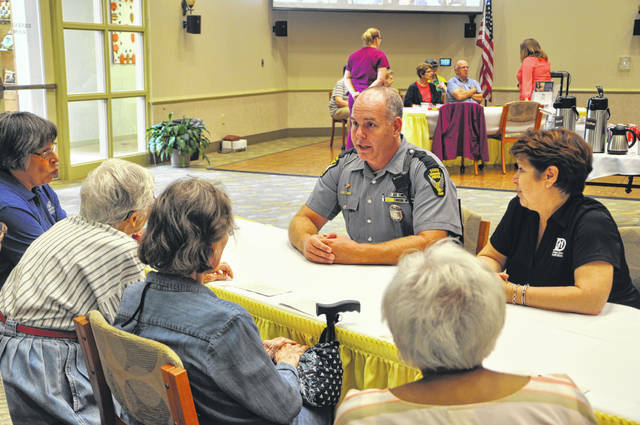 The workshops included a presentation by DATA about how its services work and attendees could tour inside a bus; a question-and-answer session with Ohio State Highway Patrol Trooper Scott Davis; a presentation by an occupational therapist about new driving technologies and the Grady Drive Program, which aims to keep seniors mobile; and a presentation by AAA about tools that mature drivers can use to ensure they are as safe as possible on the roadway. Jackie Bain, a community health specialist with the Delaware General Health District and SAFE Delaware County Coalition coordinator, said the event was not about taking the keys from mature drivers. “It’s about making mature adult drivers feel confident with how to evaluate their driving ability,” Bain said. Bain added in many cases, things that make it difficult for mature drivers to physically operate their vehicles can be alleviated with knowledge or tools, and she said the workshop is teaching mature drivers about how to self-regulate. The event concluded with a free CarFit inspection, which Schwind said gives a quick, yet comprehensive check on how well an older driver and their vehicle work together. https://www.delgazette.com/wp-content/uploads/sites/40/2018/07/web1_AAA-2.jpgOhio State Highway Patrol Trooper Scott Davis and SAFE Delaware Coalition Coordinator Jackie Bain speak to drivers and answer their questions Thursday during the Mature Driver Workshop at SourcePoint. 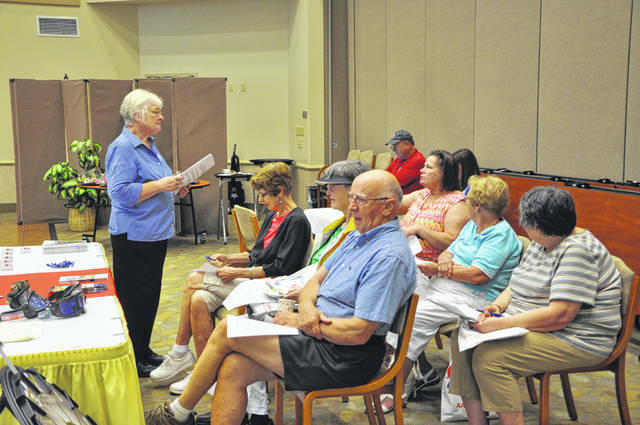 https://www.delgazette.com/wp-content/uploads/sites/40/2018/07/web1_AAA-1.jpgMary Lou Gallimore, a traffic safety programmer with AAA, answers questions about safe driving and resources Thursday during the event at SourcePoint. Attendees at Gallimore’s station also had the opportunity to spin a wheel and win driving-related prizes from AAA.